I was toying with the idea of doing a blog tour of my apartment for a few months and, with the urging of several friends, finally decided to go for it. Even though it’s not the first room you would see when walking into my place (that would be the living room), I wanted to start in the kitchen. Side note: Most of the links will take you to larger close-up shots of the items I’m describing. Other links will take you to purchase options, if available. 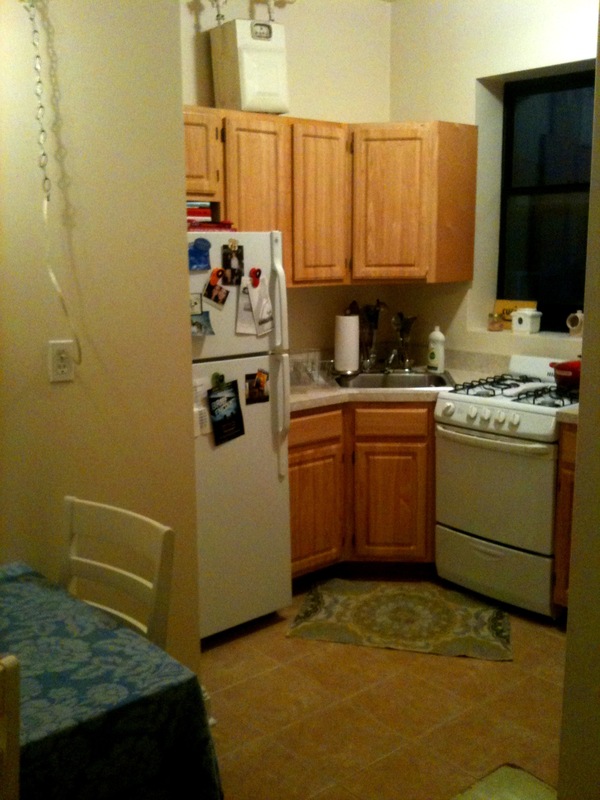 It looks like a standard-issue apartment kitchen anywhere in the United States. BUT, my friends, this is New York City. I have an EAT-IN kitchen! This is pretty much unheard of here. Here’s a reverse shot. The shelf over my butcher block island, which holds my collection of tea cups and saucers, is a painted board from Ikea with brackets from Anthropologie. The fruit bowl was a housewarming gift from a friend. 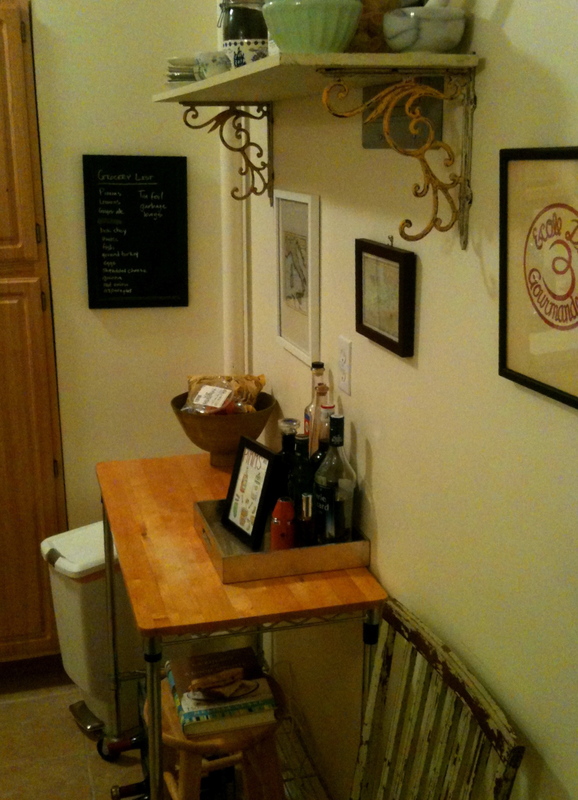 My bar setup features a custom illustration from my favorite illustrator/comic artist, Lucy Knisley. 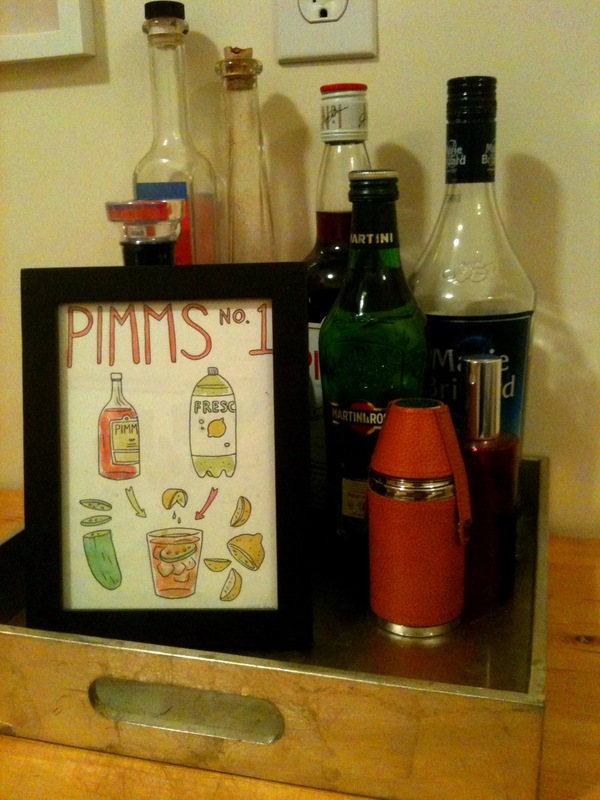 Lucy and I share a passion for Pimm’s Cup, so I asked if she would draw her recipe for me. The bar tray is from West Elm. Little flask on tray was a gift from a friend (Apartment 48). 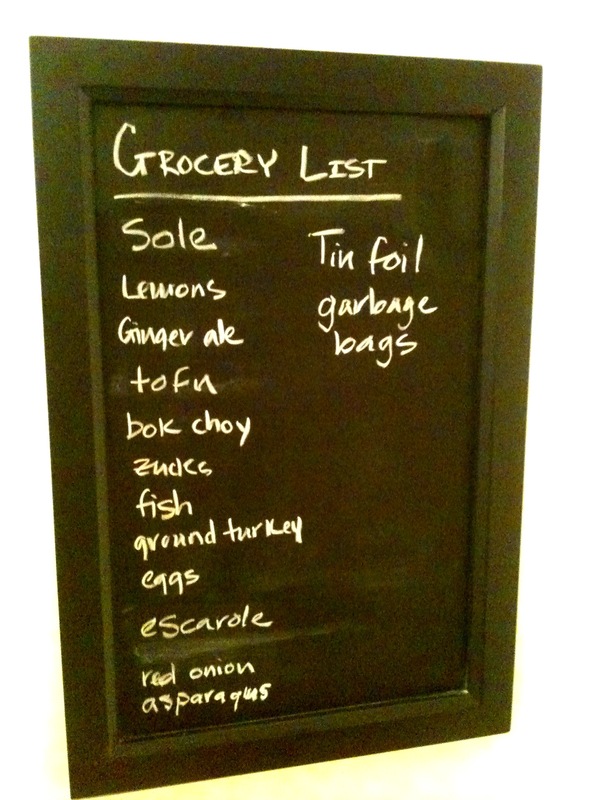 The little chalkboard (from Pottery Barn) has my current grocery list on it. In high school, I had seen a giant version of this in the home of a friend who is a film production designer, I’ve wanted one ever since. I picked up a few things in my apartment from various movie set sales. The butcher block island is from Manchurian Candidate (free! 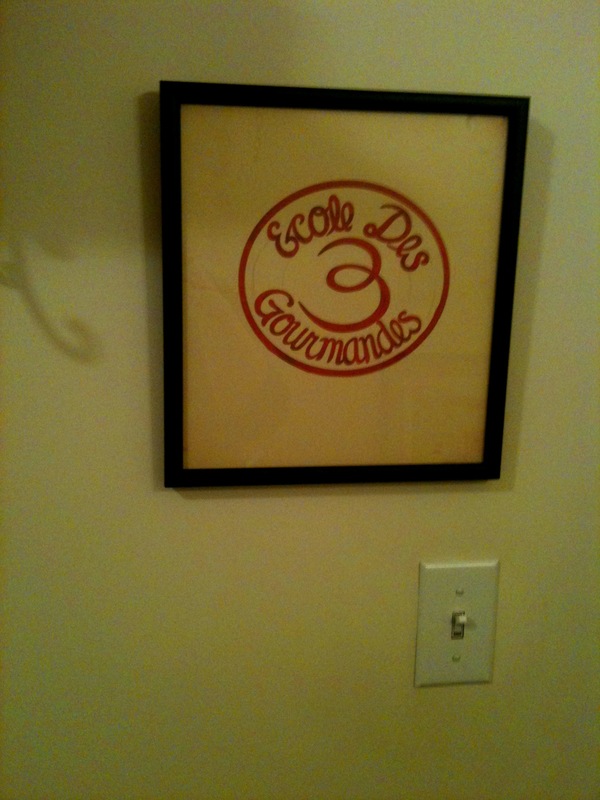 ), the chair and the framed logo on the wall above it are from Julie & Julia ($20 total). Also found on the walls of my kitchen, maps from the places I’ve traveled. See, a table and chairs! I pull the table out a bit and flip-up the side extension to seat more people. I swear I didn’t set the table for this photo shoot. I had my sister and her boyfriend over for dinner that night. 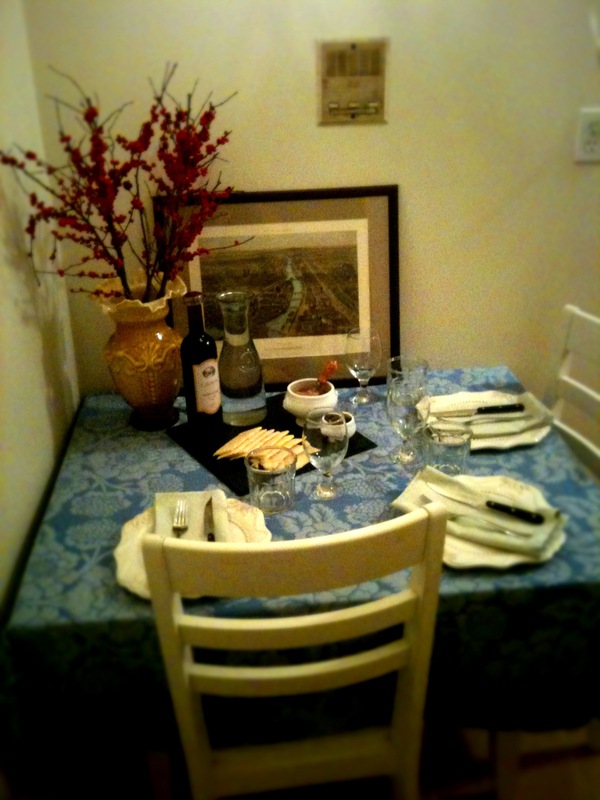 The table and chairs were purchased (for $90) from a store in New Jersey that was going out of business. The tablecloth and linen napkins (cause that’s how I roll) are from Anthropologie (on sale); plates are from Home Goods and were a gift from my sister. Glasses and silverware from Target and Crate & Barrel. The vase is from Fishs Eddy. I bought it (for $25!) when I was in high school, knowing one day I would have an apartment to put it in. I like to think ahead. 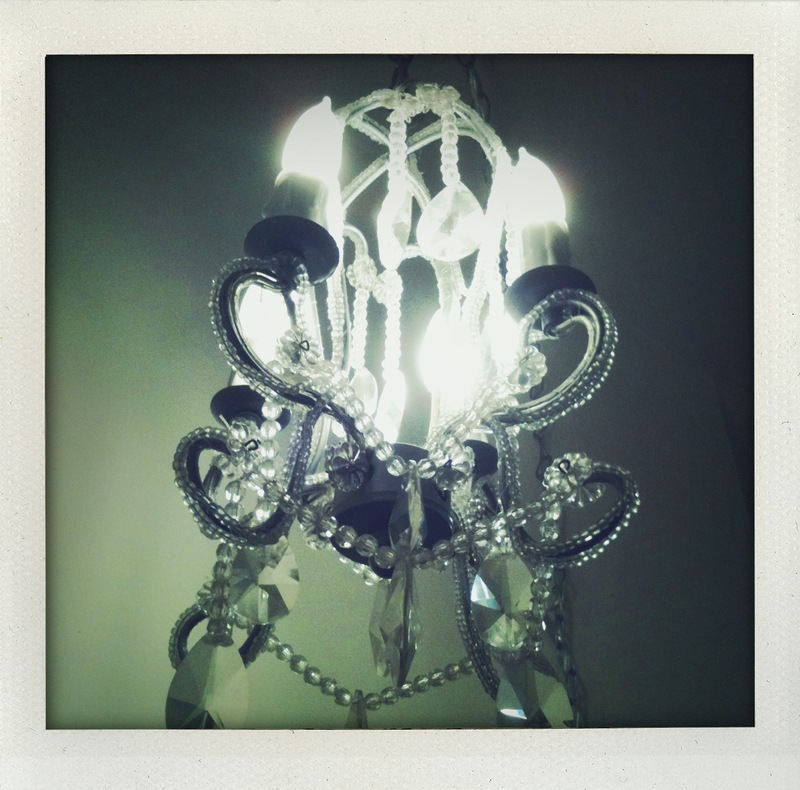 And, if you looked overhead while sitting at the table, you would see this chandelier. 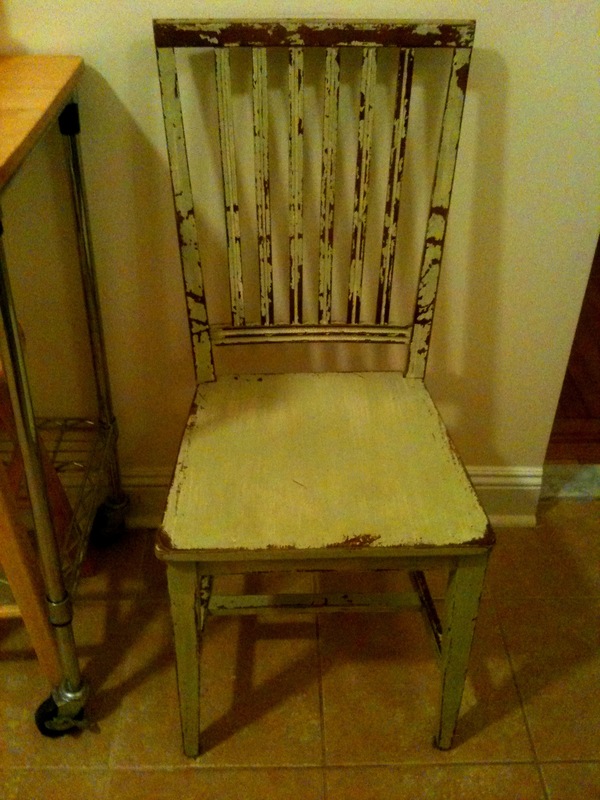 I snagged it for $25 from a Shabby Chic-esque store in Point Pleasant, New Jersey. Lastly, my fridge. 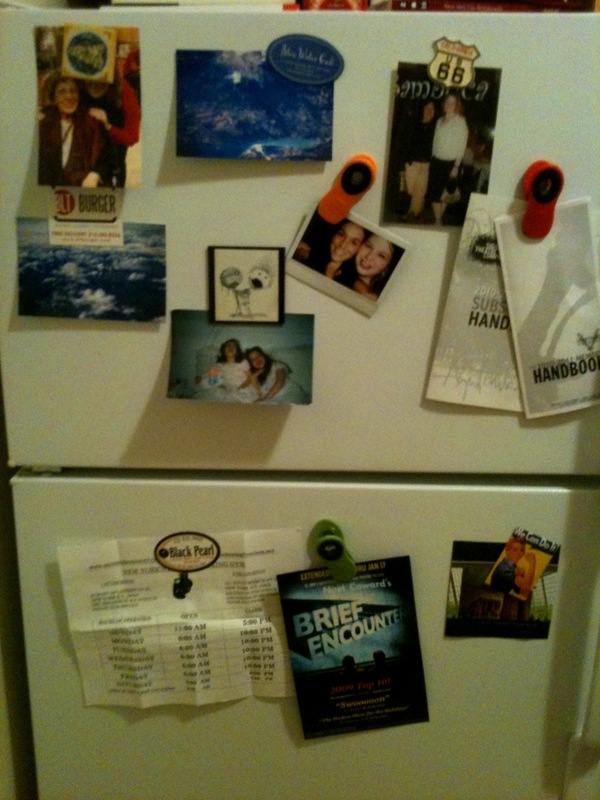 I grew up with a fridge that wasn’t magnetic, so posting things on it still feels like a novelty to me. 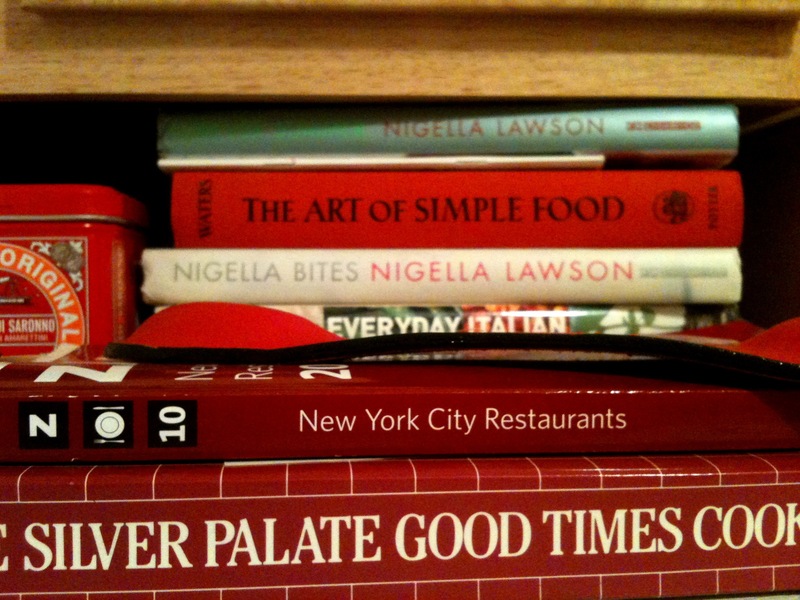 Above the fridge are a few of my cookbooks. These are the ones I use most often. 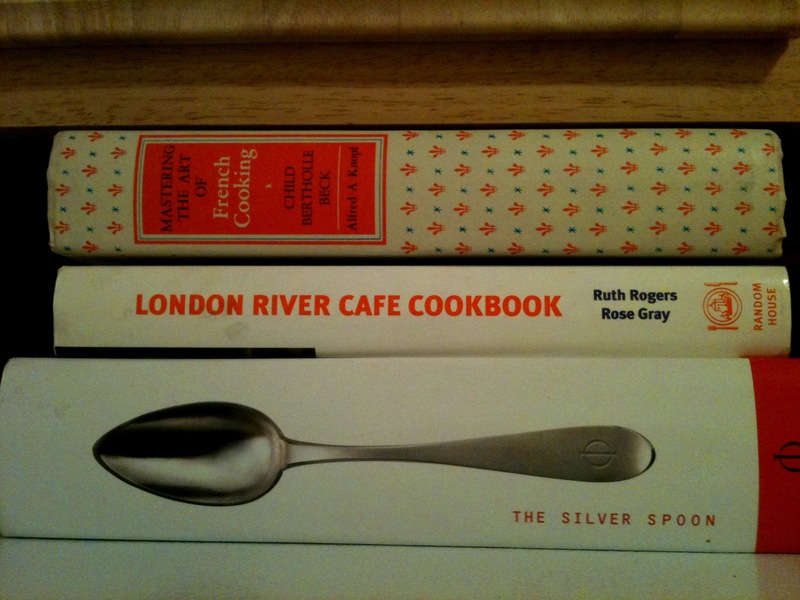 My copy of Mastering The Art of French Cooking was given to me at the Julie & Julia sale. It was one of four used in the film. 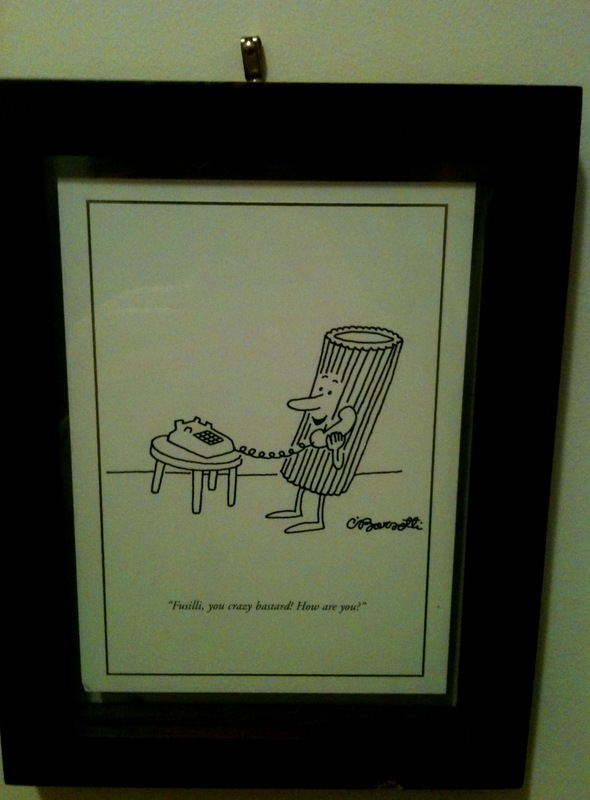 To the left of my fridge hangs a print of my favorite New Yorker cartoon, and to the right, my knives and some cooking tools. All gifted or purchased from Williams-Sonoma. I’m a big fan of Global knives. 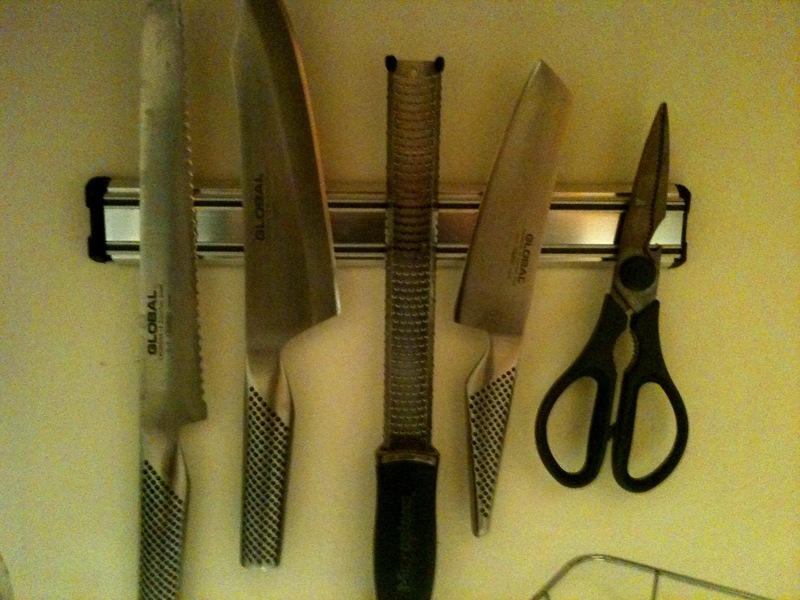 They’re just heavy enough without bothering your wrist and they slice, dice & chop beautifully. Check back tomorrow for my favorite room, the living room!